Learn some core Tools concepts and terminology. According to the alphabetic principle, letters and combinations of letters in written words represent sounds in spoken words, and the order of letters matches the order of sounds (i.e., the first letter in a word represents the beginning sound). Understanding of alphabetic principle is critical for mastering reading and writing for languages such as English, Spanish, French, or German. Child-initiated activities in an early childhood classroom can range from activities totally controlled by a child to activities in which the teacher presents new content or makes changes in the environment, based on her observation of children’s interests. It is important, however, not to mistake children’s aimless wandering from center to center or their “dump and run” treatment of toys as being truly intentional choices. The signs of a genuine child-initiated activity include the child’s ability to express awareness of an activity before engaging in it (e.g., talking about the activity outside of choice time), to stay engaged in an activity for a substantial amount of time, and to demonstrate, over time, increased levels of mastery of the skills necessary to sustain the activity (e.g., becoming more skilled in building with blocks). A Tools of the Mind classroom is filled with activities in which children initiate learning. Teachers pursue concepts and ideas that children want to explore in science. Children choose their play center and decide what they are going to play. They organize and create pretend scenarios on their own; they make their own props and decide how to re-purpose existing ones. Children’s interests and preferences even determine exactly how a play theme will unfold in a specific classroom. For example, when playing “Pets and Vets” one group of children may want to stage a dog show, another may want to set up a pet store, and yet another may want to open a humane society shelter. According to Vygotsky, children’s social interactions are important, not only for providing an authentic context for learning and for supporting the development of social skills, but because they actually shape the way children develop their higher mental functions. Vygotskians advocate designing cooperative activities such that, in the beginning, it takes an entire team (or a pair) to complete a task, but with practice, all children are able to complete the task on their own. For example, young children have trouble when they need to carry out an action, such as counting, and at the same time, figure out if the result of their counting is accurate. After alternating between counting on their own and checking their partner’s counting, children eventually integrate both components of the task (counting and checking) and become able to monitor their own actions. In Tools classrooms there are many activities in which children work in cooperative pairs, with each child having a different role in the activity. For example, in Buddy Reading, children take turns reading. One child holds a picture of lips to remind him to “read.” The other child holds a picture of an ear to remind her to listen. This ensures that each child gets a turn to “read” and that the child whose turn it is to “read” knows that he or she has to talk about the book. Dynamic assessment is an assessment method based on Lev Vygotsky’s concept of Zone of Proximal Development (ZPD) and first used by Vygotsky’s students. Currently this method is gaining popularity in the West, particularly for assessing children with special needs and second language learners. When conducting dynamic assessment, the teacher identifies both the child’s independent level of performance as well as the child’s ability to respond to scaffolds provided by the teacher. The teacher gives prompts, hints, and cues to the child and watches the child’s response to this instruction. The teacher’s actions and the child’s reactions are both recorded. This becomes a blueprint for developing an intervention for this child. When children are learning to write, they go through a stage in which they write letters to represent sounds within words but they do not represent all of the sounds. Or, they choose letters based on what they hear and not according to the rules of phonics. This stage in writing development is called estimated spelling. Some authors also refer to it as invented or developmental spelling. Estimated spelling helps children learn about sound-letter relationships and makes it possible for them to read their own writing, long before they completely master the art of spelling. Contrary to what one might believe, estimated spelling does not interfere with children learning to spell conventionally; it actually helps them become better spellers as they refine their estimated spellings, using dictionaries and spellcheckers. Executive functions is an umbrella term used by researchers to describe a core set of skills needed by humans to be able to engage in deliberate, self-regulated behaviors. These skills include inhibitory control, working memory, and cognitive flexibility. Executive functions influence both cognitive processes, such as learning something new, and social emotional behaviors, such as delaying gratification and exercising self-control. Executive functions are required whenever going “on automatic” would not suffice or would be detrimental to learning or acting intentionally. Tied to the development of the prefrontal cortex, executive functions emerge in late infancy, go through a growth spurt during the early childhood years, and do not fully develop until age 25. Inhibitory Control is the ability to resist a strong inclination to do one thing and instead do what is most appropriate or needed. For example, instead of grabbing the toy he wants from another child, a preschooler might think of a social strategy he could use to get the toy, like asking for a turn or offering the child another toy. Inhibitory control is also critical for academic learning, since it affects children’s ability to switch to a new learning strategy, rather than using an old one out of habit. Working Memory refers to the ability to hold information in mind, while mentally working with or updating it. Working memory makes it possible to reflect on one’s thinking (meta-cognition) and is critical to one’s ability to see connections between seemingly unconnected things, which is the essence of creativity. Explicit instruction is defined as deliberate teaching designed to focus students’ attention on a specific competency or goal. It usually involves providing information, modeling, and providing guided practice. Explicit instruction in the early childhood classroom does not necessarily mean teaching isolated skills and concepts out of context. Many Tools of the Mind activities have explicit instruction, from make-believe play practice, where children learn about the ways their characters act and talk, to play planning, where children are taught how to represent themselves symbolically and how to write down their messages. Unique to humans, higher mental functions are cognitive processes acquired through learning and teaching. The main difference between lower and higher mental functions is that the latter involve the use of mental tools. All higher mental functions are acquired through a system of practices common to a specific culture. Vygotsky describes higher mental functions as deliberate, mediated, and internalized behaviors. For Vygotskians, early childhood education is the first step in a long process in which young children are engaged in the acquisition of “tools” and in the development of higher mental functions, which are learned from the people in the child’s world. According to Vygotsky’s “law of higher mental functions” these functions first emerge as shared or as distributed between two or more people; later they get internalized by the individual. Self-regulation, for example, starts out as other regulation, in which a child either gets regulated by someone else or practices rules and expectations by regulating another person. As these rules get internalized, the child becomes able to apply them to herself, thus engaging in true self-regulation. Vygotskians describe leading activity as the activity during which most new cognitive and social development occurs. Each age period has its own leading activity. The leading activity for preschool- and kindergarten-aged children is mature, intentional make-believe play. Each leading activity lays the foundation for the next, meaning that if make-believe play reaches its mature level by the end of kindergarten, the prerequisites for the next leading activity—which for middle childhood is learning activity—can be expected to emerge. According to Vygotsky’s student Daniel Elkonin, learning activity is the leading activity of middle childhood (approximately ages 6­–12) and leads to the development of such competencies as theoretical reasoning and reflective thinking. However, these competencies will fully develop only when a specific kind of instruction is takes place, one that focuses on learning how to learn, not just on the acquisition of isolated skills and concepts. Lev Vygotsky (1896-1934) lived and worked in Russia, but he made important contributions to psychology and education that have crossed the boundaries of space and time. While his theoretical work has been influencing scholars in the West since the 1960’s, the practical applications of his theory have not been thoroughly explored outside of Russia. None-the-less, Vygotsky’s students and colleagues, such as Daniel Elkonin, Pyotr Gal’perin, and Alexander Zaporozhets, have successfully applied his ideas to early childhood and elementary classrooms, proving that these ideas are not only inspiring but also practical. Connery, M. C., John-Steiner, V. P., & Marjanovic-Shane, A. (Eds.) (2010) Vygotsky and Creativity: A cultural-historical approach to play, meaning making, and arts. New York, NY: Peter Lang Publishing, Inc.
Kozulin, A., Gindis, B., Ageyev, V. & and Miller, S. (eds.). (2003) Vygotsky’s Educational Theory in Cultural Context. Cambridge, MA: Cambridge University Press. Moll, L.C. (Ed.) (1990). Vygotsky and Education: Instructional implications and applications of socio-historical psychology. New York, NY: Cambridge University Press. Children play well-defined roles and follow the rules for how to act when playing a particular role (e.g., the “doctors” acts in a specific way, the “patients” act in another way). Children use symbolic props and can invent props when they don’t have them. Children create a pretend scenario (e.g., “I’m going to pretend that I am the doctor and you are the mom and you have a sick baby”). The scenario can be extended later and modified as the play unfolds. Children can play for a long time. They can act out a single play scenario for hours and continue building on it for days. Children use language extensively. They discuss who they are each going to be and what will happen during the play. They also userole speech and adjust the way they talk, depending on the specific role they play. The Response to Intervention (RtI) and the Recognition and Response approach for early childhood address the needs of children who are at risk for learning disabilities. These approaches involve observing the child’s response to instruction in activities of the core curriculum, and then selecting scaffolds and supports (from multiple tiers of increasingly intense interventions) that can help the child to be able to learn with her classmates. The goal is to facilitate the child’s performance and learning within the core curriculum. Looking at the child’s progress in the classroom—rather than waiting until the child has been “diagnosed” as having a specific disability—can prompt much earlier intervention than previously was the case. Moreover, RtI assumes that children will access the supports they need for learning in their regular classroom, based on a need, not a label. The child’s progress may be monitored by assessments embedded within the curriculum, or by specific standardized assessments designed to monitor adequate progress in literacy and mathematics, or by a combination of both methods. First introduced by Wood, Bruner, and Ross (1976), the concept of scaffolding likens the process of building a concept or skill within a child to the kind of temporary structure that supports the construction of a house. Although at present, this concept is used in a fairly broad sense and is often synonymous with “teaching,” the original analogy refers to a learning situation in which there is a gradual release of responsibility to the learner, as the learner becomes more responsible for his/her own learning and able to maintain a new skill. The teacher gives hints and prompts to support the learner and then gradually withdraws these supports, as the learner performs with increasing independence. Scaffolding in its many forms plays an important role in the Tools of the Mind curriculum. In Tools, teachers scaffold children’s learning in a variety of ways, from organizing the environment to support learning, to giving hints and prompts, to modeling what to do, to explicit instruction. Depending on what the child is learning and where the child is in the learning cycle, the teacher tailors instruction to fit these needs. For example, if the child is learning something brand new and the child has little background knowledge, the teacher may start with explicit instruction and modeling, in order to help the child understand what is to be learned. If the child has had exposure to the skill and has practiced several times correctly, the teacher may use hints and prompts, rather than explicit instruction. All Tools activities are designed to be multi-level, meaning that children of different ability levels are able to engage in the same activities, but at individually appropriate levels. Teachers learn to scaffold learning at different levels within the same activity. They learn how to increase the challenge for each child and to scaffold appropriately, providing support and withdrawing support depending on how quickly a child is learning. Scaffolded Writing is a primary technique for teaching writing in Tools classrooms. It was developed specifically for Tools of the Mind and is recognized as a sanctioned strategy by the International Reading Association. In scaffolded writing, children first plan what they want to write, draw it, and then write it, with the help of multiple mediators, such as lines drawn to represent words. The form that the writing takes (scribbles, lines, initial letter sounds, estimated/invented spelling, word patterns) depends on where children are in their writing development. Physical tools extend human ability by enabling people to do things that they could not do without them. In a sense, these physical tools act as an extension of the human body; instead of having stronger hands a human has a “hand-ax” or a “hand-saw,” making up for the fact that, as a species, human bodies are not as strong as other animals’ bodies. Vygotsky applied the idea of human beings as “tool making animals” in a different way than his contemporaries. He extended the idea to include a new kind of tool: mental tools or “tools of the mind.” Similar to the way physical tools extend humans’ physical abilities by acting as extensions of the body, mental tools extend our mental abilities by acting as extensions of the mind (Vygotsky, 1978). Examples of mental tools range from simple ones, like a string one ties around a finger to remember something, to complex ones, such as written language. Bodrova E., & Leong, D. J. (2012). 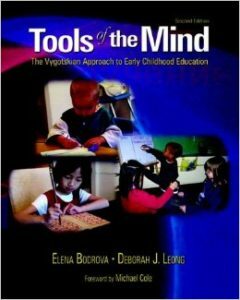 Tools of the mind: Vygotskian approach to early childhood education. In J. L. Rooparine & J. Jones, Approaches to early childhood education (6th ed.) (pp. 241-260). Columbus, OH: Merrill/Prentice Hall. Bodrova E., & Leong, D. J. (2011). Revisiting Vygotskian perspectives on play and pedagogy, In S. Rogers, Rethinking play and pedagogy in early childhood education: concepts, contexts, and cultures. (pp. 60-72). New York, NY: Routledge. Bodrova, E. & Leong, D. J. (2007). Play and early literacy: A Vygotskian approach. In K.A. Roskos & J.F. Christie (Eds. ), Play and literacy in early childhood (2nd ed.) (pp. 185–200). Mahwah, NJ: Lawrence Erlbaum Associates. Bodrova, E. & Leong, D. J. (2006). Vygotskian perspectives on teaching and learning early literacy. In D. Dickinson & S. Neuman (Eds. ), Handbook of research in early literacy development, Vol. 2 (pp.243-256). New York, NY: Guilford Press. Bodrova, E., & Leong, D. J. (2004). Learning and development of preschool children: The Vygotskian perspective. In B. Gindis, B, A. Kozulin, V. Ageyev, & S Miller, ( Eds. ), Vygotsky’s educational theory in cultural context (pp. 156–176). Cambridge, England: Cambridge University Press. For Vygotsky, development of a behavior occurs on two levels, which form the boundaries of the Zone of Proximal Development or ZPD. The lower level is defined by the child’s independent performance—what the child knows and can do alone. 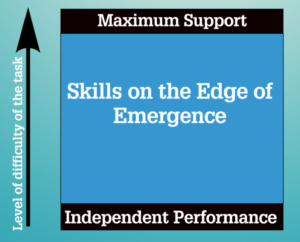 The higher level is the maximum the child can accomplish with help; this is the level of assisted performance. Varying degrees of partially assisted performance lie in between maximally assisted performance and independent performance. Vygotsky’s idea of the Zone of Proximal Development reflects both the complexity of the relationship between learning and development and the dynamics of the transitions from shared forms of mental processes to their individual forms. Source: Vygotsky, L. (1978). Mind in society: The Development of Higher Mental Processes. Cambridge, MA, Harvard University Press. "Our district participated in a university federal research project of Tools of the Mind and our Tools’ Kindergarten children were, three years later, number 1 and 2 in the state’s third grade testing. It works." "In the world of Early Childhood Education, there is often a tension between rigor and developmentally appropriate practice. Since we began implementing the Tools of the Mind curriculum three years ago, we have come to not only believe but also now strongly advocate for the idea that both of these approaches can be done well, together!"